Review by FuManchu and Rukiafan. 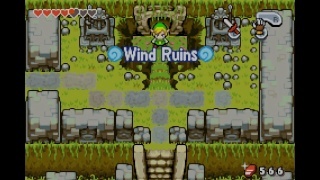 The Legend of Zelda: The Minish Cap is the fourth and final entry in The Legend of Zelda: Four Swords timeline and it's the only game in the series that the tribe known as the Minish make an appearance. 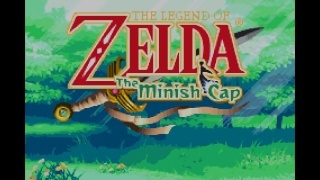 The game focuses heavily on the titular Minish Cap which you will meet early in the game. The cap will give you the power to shrink down to Minish size and access areas that you can't reach in your normal size. There are several dangers being this small, however as puddles and even rain are dangerous to the mini-sized link. The puzzles are well balanced and usually aren't too difficult to solve, however should you quit during an important part of the story the game doesn't do a good job at refreshing your memory so choose your resting breaks carefully. The game is very short for a title in The Legend of Zelda series with the story clocking in at under 10 hours. Taking on the sidequests and obtaining all of the Kinstones, however will at least double the time it will take to finish a single playthrough. The bosses in the game range from standard enemies that are made huge due to Link's Minish size to straight up challenging and unique enemies never before seen in the series. 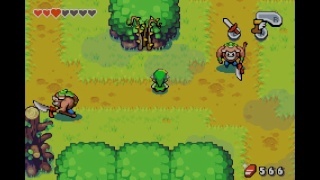 The Legend of Zelda: The Minish Cap looks impressive for a GBA title with its colorful yet detailed characters, fields, and dungeons that have a pseudo 3D appearance. The music is even better than those of ALTTP which is impressive given the limitations of the handheld's audio. Final Verdict: The Legend of Zelda: The Minish Cap is a unique entry of The Legend of Zelda series that showcases the power of the GBA with both innovative gameplay, superb graphics, and impressive audio it's no wonder that the game has received such positive reviews from critics and this review is no different. If you haven't downloaded this game yet then what are you waiting for? I still haven't finished this game. I need to get on that right away! Thanks for allowing me to finish the remainder of your review @FuManchu and thank you for helping us out! I don't know when you'll return, but we're going to miss your signature mustachio avatar in the articles! This is my favorite handheld Zelda game. Great review! The tune for Minish Woods is on my list of "Top 5 Most Beautiful Tracks from the Legend of Zelda Series", along with Zora's Domain and some others I still need to remember. Good review I agree that this is fun game! Just finished this game today. Absolutely love it, tons of stuff to do. Awesome pixel art! Great review! One of my favorite 2D Zeldas right here. Great review FuManchu! Still have the original, safely put away in its box, in my Zelda collection. I still need to complete this game. In fact, my backlog is really extensive at the moment. GamerZack87 wrote: I still need to complete this game. In fact, my backlog is really extensive at the moment. Why don't you add the backloggery feed to your signature like I did? It's small enough that it won't look cluttered even if you have a real signature above the feed. This is still my favorite Handheld Zelda in the series. Not including remakes of console games of course. It was different enough to stand out from the normal series games kinda like Majora's stood out. I'm glad a whole new generation gets to experience this game.